A very merry Anachronistic and Impulsive Arts and Crafts Weekend at Anna’s Rome! This is what happens when I catch a cold, miss an event, and decide to not do homework. When I’m sick, I get bored, and when I’m bored and hopped up on cold medicine, well…I needed to tinker. Edited on 9-28-2015 to add finished pictures. 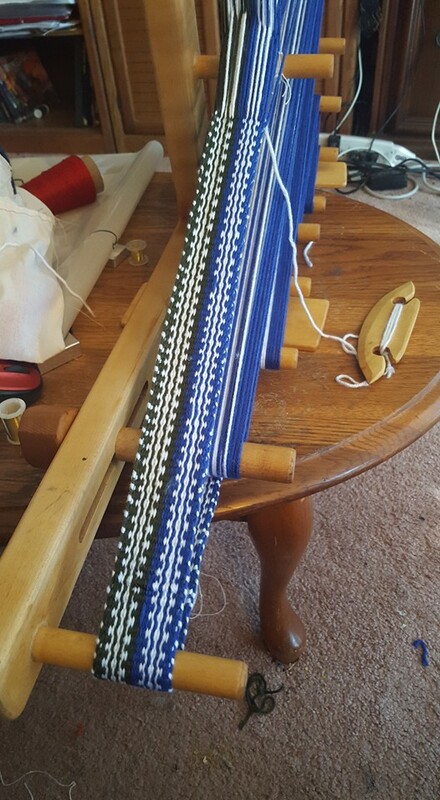 Well, I started by warping up the inkle loom and making the Norman husband a pair of leg wrappings in his heraldic colors. They’re pretty crappy in some places, and hence, leg wrappings, rather than trim. This is the first full 6 yard band I’ve ever made! Material is acrylic yarn, because I wanted them thick,washable, and low-cost in case of it turning into a cat toy. I did okay though, so now I’m more confident in trying wool yarns for the next batch. I finished this in a day. I warped it Saturday night and by Sunday night the band was complete. I was a MACHINE. The pattern when I hit my stride. 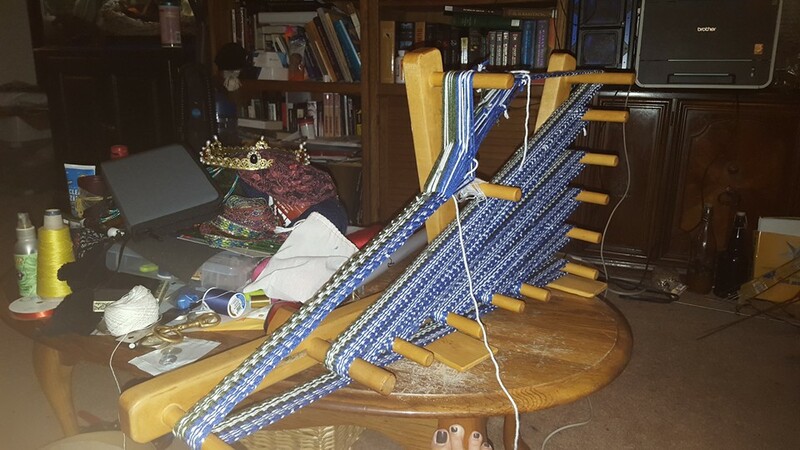 FULL LOOM! And a coffee table full of craft supplies. BOOM! 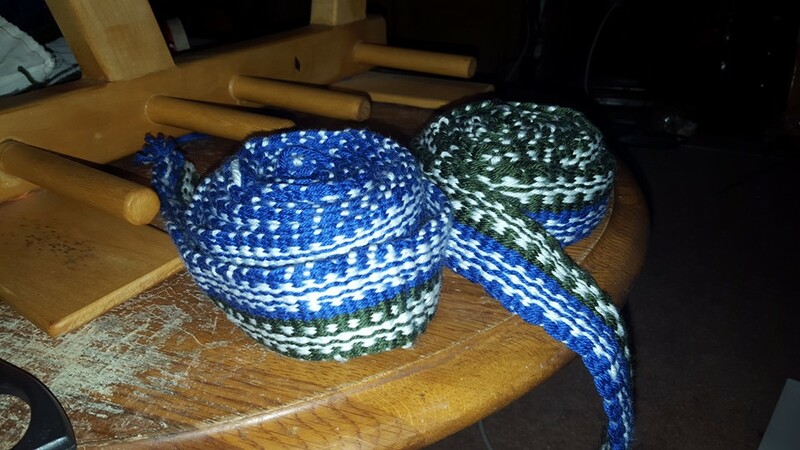 A pair of leg wraps at 3 yards each, about 2.5″ wide. Oh yeah, see that coronet on the table? I made that too. 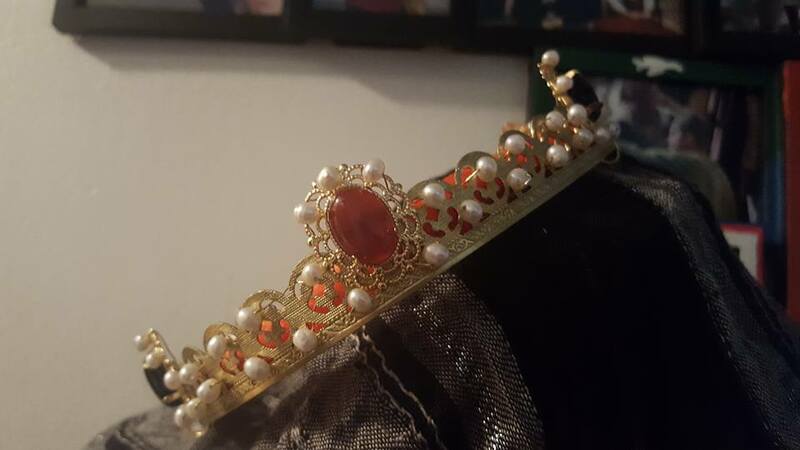 Norman Husband challenged me to make a coronet with him out playing Navy. Him not around left with me NO METALWORKING SUPPLIES. So, I had to play, and go buy a new beading pliers set. And JB Weld. I could NOT have done this without clear 2-part epoxy. G-S Hypo Cement did not cut it except for gluing the band itself together and the cabochons onto the settings. It did not hold the settings onto the band. I’m still not 100% finished with it, when I am I’ll post finished pics. I set up a “coronet bar” on my kitchen counter, because it’s high enough for me to not hunch, and I have great lighting. Findings are just some vintage brass lamp banding and shiny bits from Fire Mountain. 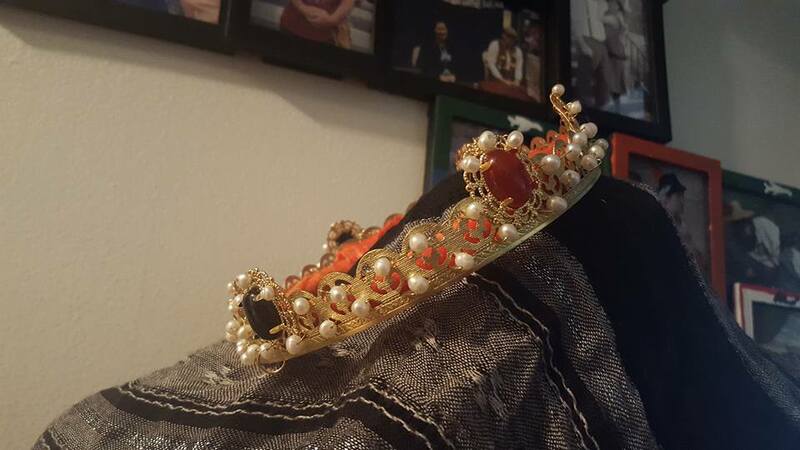 Stones are real carnelian and onyx, and pearls. Lots and lots of freshwater pearls. Not only very period, but also my heraldic colors. Epoxying the cabs on the band. 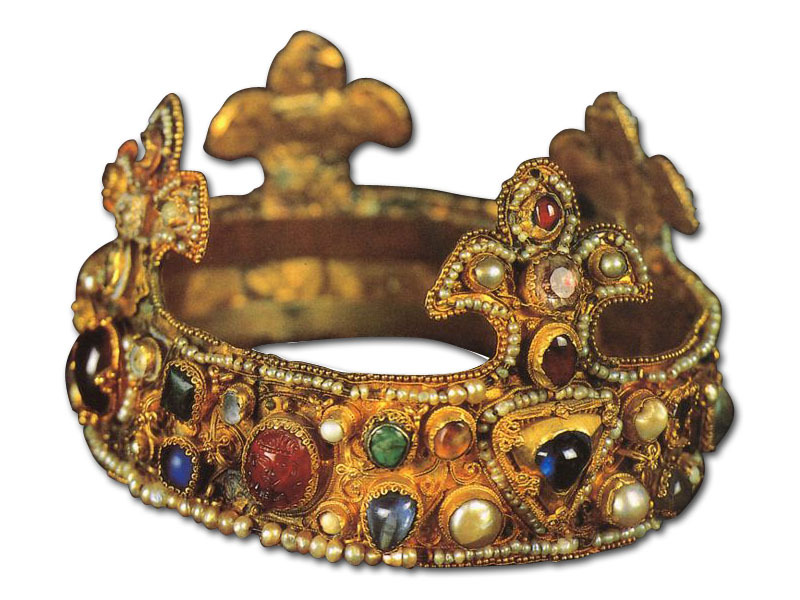 Lotsa Byzantine. 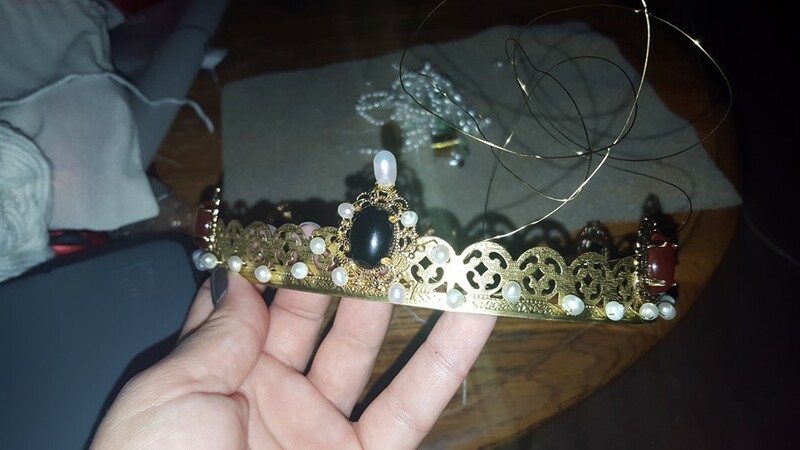 I’m just attaching the pearls by weaving wire through openings in the brass. I marathoned the original Star Wars Trilogy while I worked on this. It gives you an idea of how long it took. Here it is almost done with some Darth Vader. Here it is on my head. 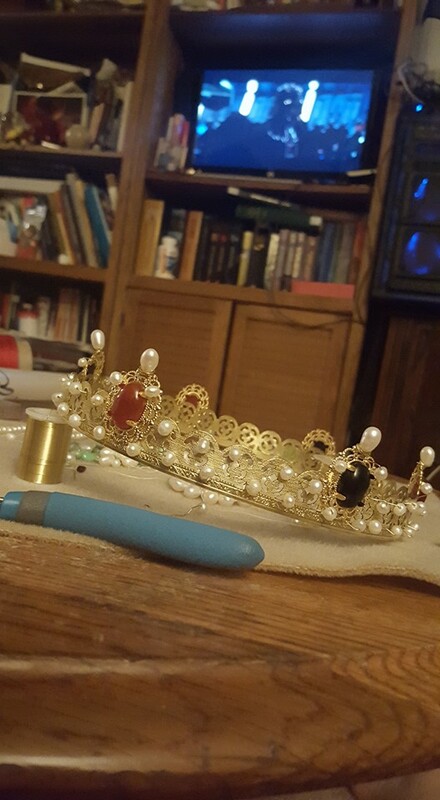 I think the top pearls make it look too Western (boo hiss), so I’m going to cut them off, and replace them with round pearls. I could have gone WAY OVER THE TOP with this, and wanted to, but I was talked out of it, and I’m glad. I added rings on each side near my temples for a pair of pendilla to hang from. I don’t have the pendilla made yet, and I don’t ALWAYS have to wear them. Notes after wearing for an event: Too much padding, it didn’t want to stay put. 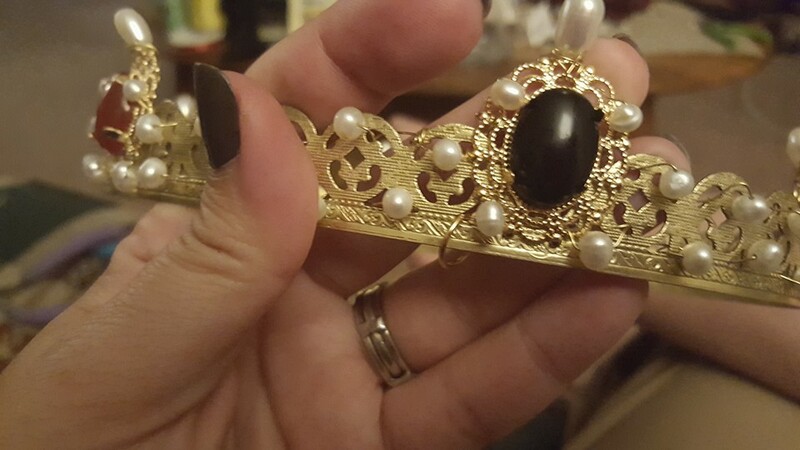 I know coronets are jewelry and not a headband, but still. I’m going to try a different method before I wear it next. 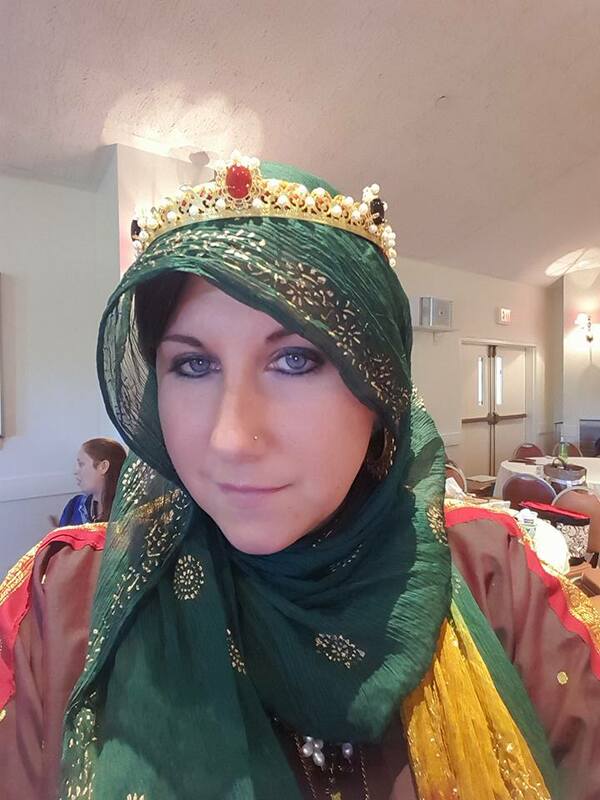 Also, I got a lot of compliments on my veil. All it is, is a green/yellow/red ombre dyed Indian dupatta. It still smells like batik. I wrapped it and tucked it into my belt in the front based on some icons and manuscripts I’ve seen. No, using vintage lamp brass and epoxy aren’t exactly period techniques, but it creates the illusion for now until Norman Husband completes the Hagia Sophia of Coronets he’s promising me. 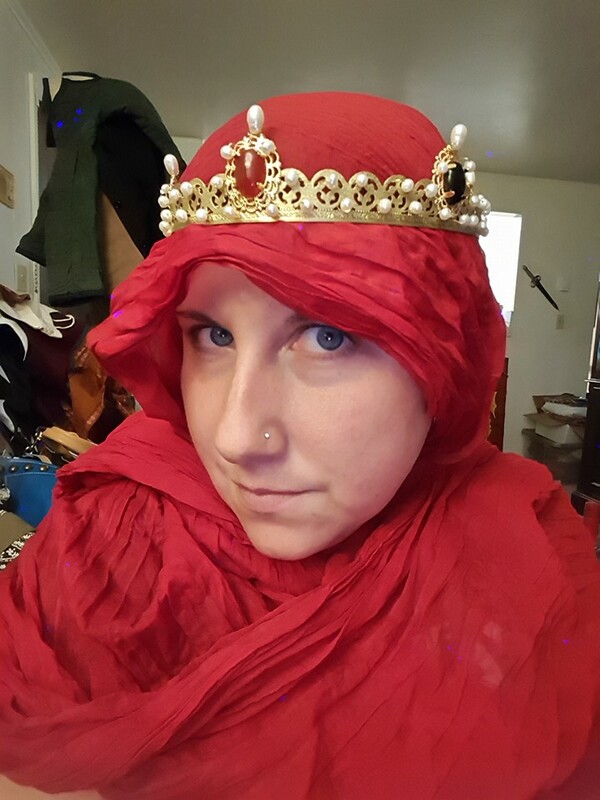 Plus, this is dainty and clocking in at 1 3/4″ at the tallest, so it works for periods I wear that AREN’T Byzantine. 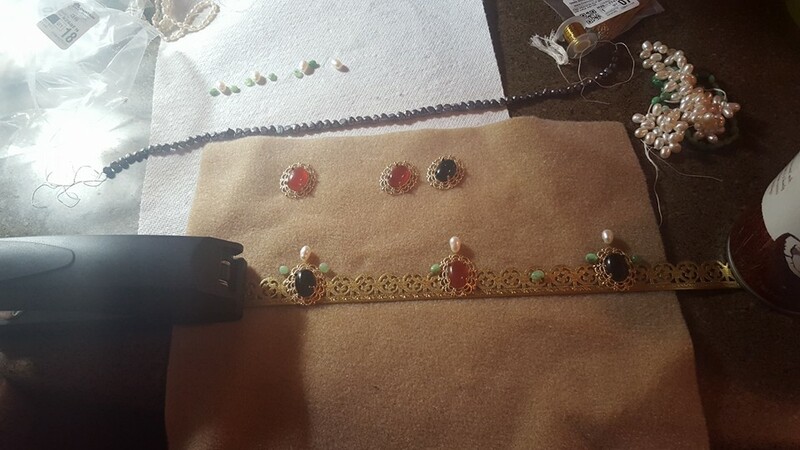 I’m not a jeweler, and especially not a hat maker, so even three days later my hands are KILLING ME. 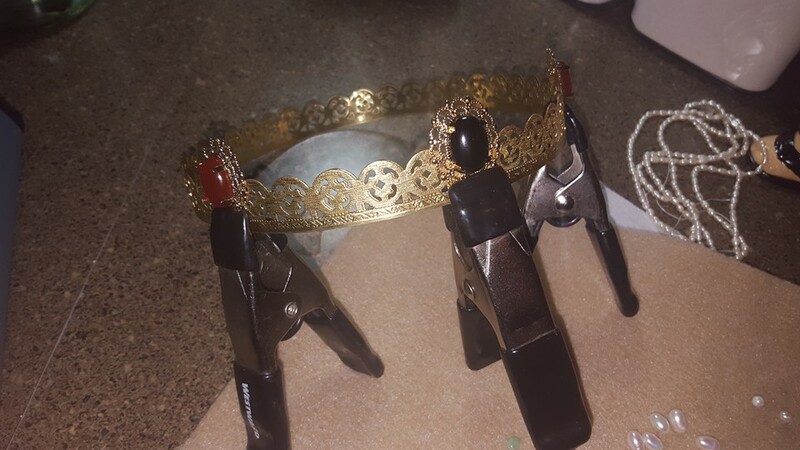 Here’s a couple of Byzantine crowns that I pulled some [vague] inspiration from. 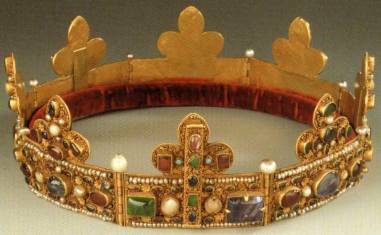 They didn’t always wear votive crowns and massive tall hinged plaque things of doom. And last but not least, OMG SHOES. 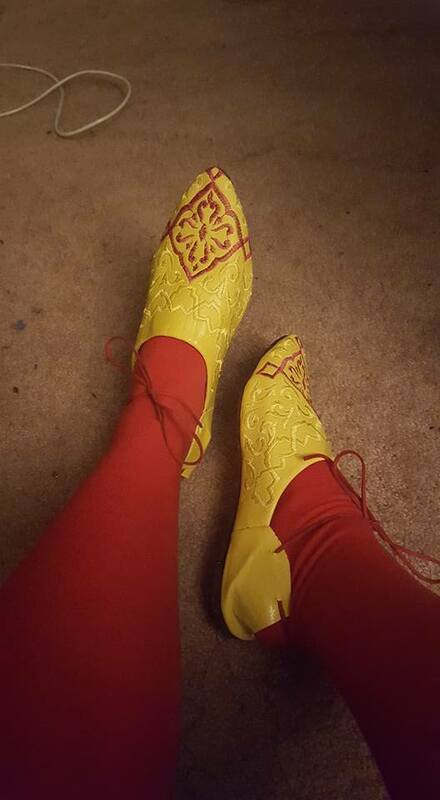 If you read my previous post, I made a blurb about what color shoes are appropriate for a Byzantine persona. 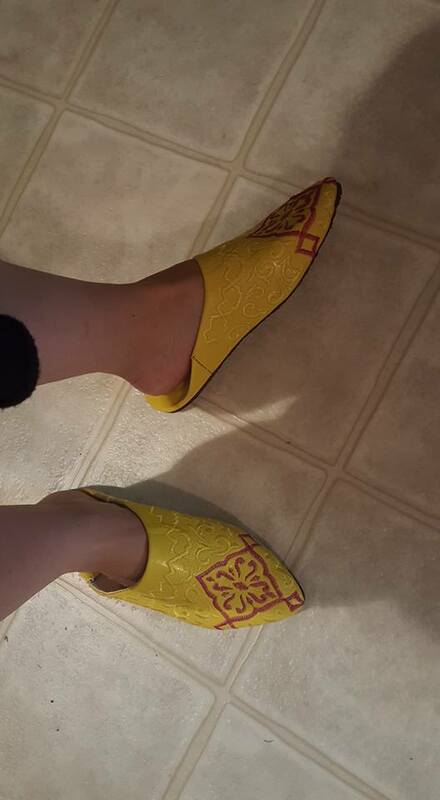 As a court baroness, I could get away with yellow, so, I wanted to see if I could invest in a pair of proper Eastern looking shoes. 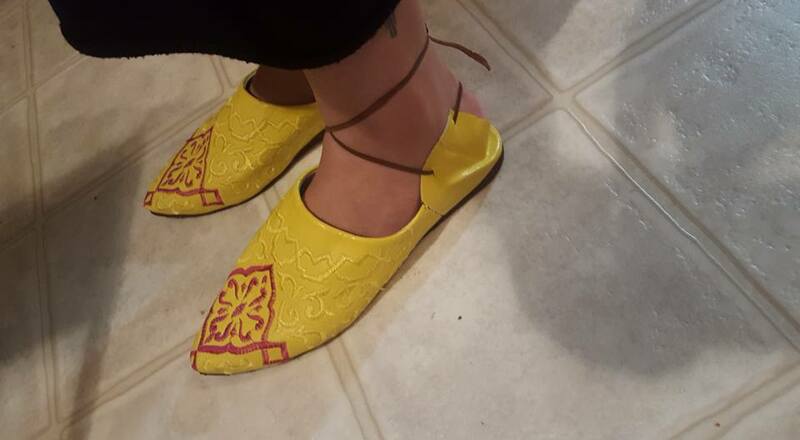 Unfortunately, most medieval cordwainers don’t make Byzantine or Middle Eastern shoes (that’s a hint, folks) so I had to improvise. I hate HATE HATE wearing Pakistani/Indian Khussa, because they eat my feet alive. Even if I shower with them on, or wet my feet, they just never break in, and rip me up. That’s no fun. So some searches yielded Moroccan Babouches. These are actually pretty perfect, except that they’re backless. 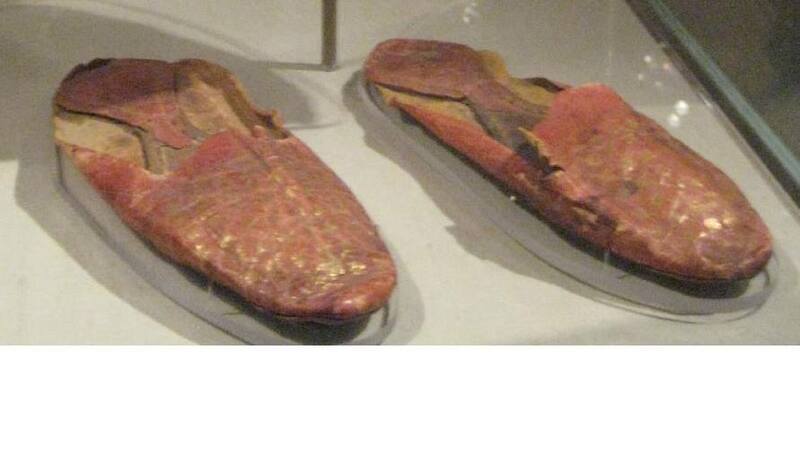 Now, extant mules have been found, and are still worn in Turkey today, but I hate backless shoes, mostly because as you can see in these pics, my feet and ankles are very narrow. It makes mundane boot shopping a crappy experience when the material just pools around my ankles. 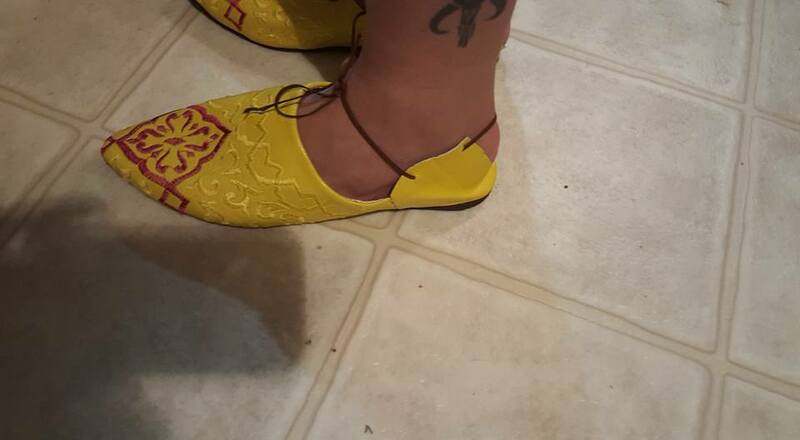 I found these super awesome embroidered babouches on Etsy. They look very…Calontir. 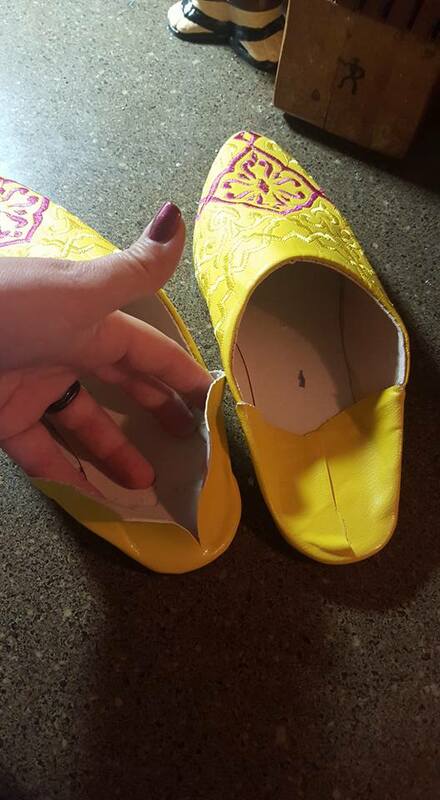 I ripped the backs up to find that they’re designed in a way that you cannot fit your foot in comfortably, so, I split them down the back. Cut holes with scissors on cutting board, because husband brought leather tools with him while playing Navy. Find random leather strap in his leftover stuff, and lace. Walk around and immediately get blister. Tie them in the front. Ah, that’s better. Side view, they don’t look horrible. However, taking pics of your own feet is kind of tricky. I just felt so damn sassy. 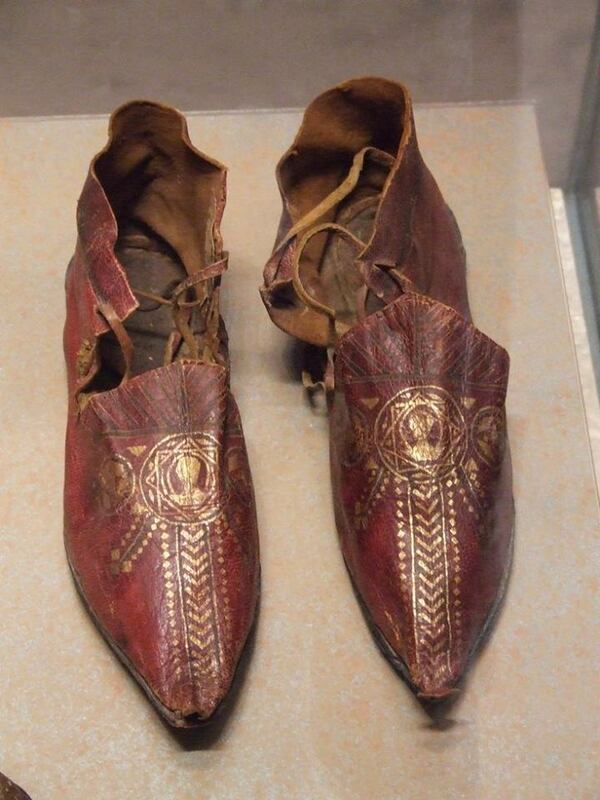 We called these the “Byzantine Chuck Taylors” on Facebook. No, the backs aren’t open. I know. I know. I IMPROVISED, OKAY? A pair of Byzantine Mules dated to 300-700 from Panopolis. Here’s that backless option for those that aren’t afraid of flat tires and don’t have feet that fall out of everything like I do. 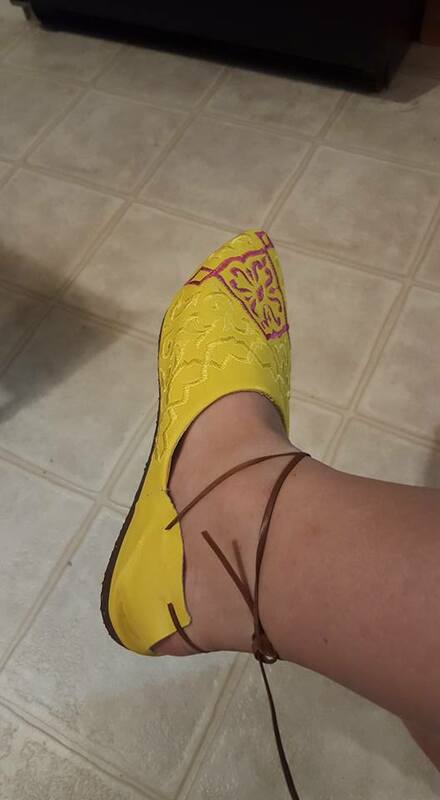 The ones I made are clearly going to be “inside event” shoes. I’ll wear them with stockings in hopes to combat some of that extra width while the lacing will stop my feet from falling out. 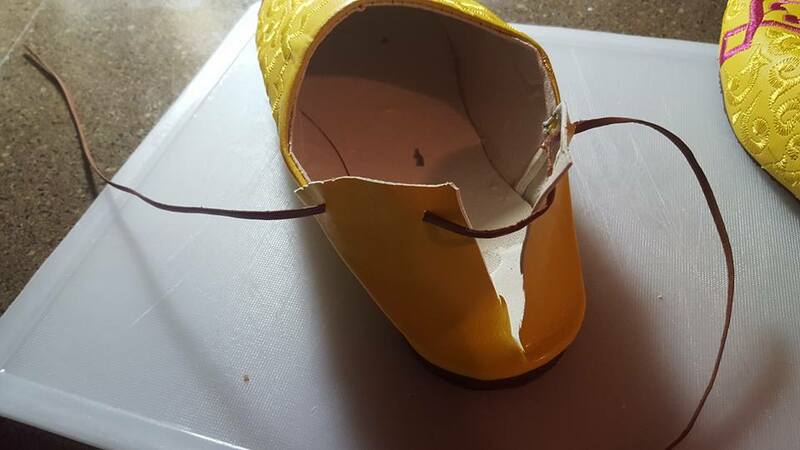 The best part that is if I want to, I can pull the lacing out of my shoes and flatten the backs again into mules. Again, like the coronet, I’m creating an illusion from modern materials. 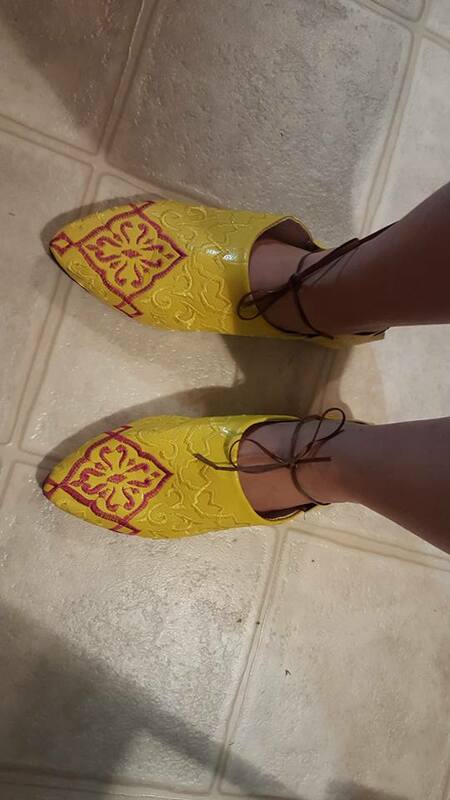 Once I’m done with my master’s degree and move across the country, I’ll have time to work on making an actual pair of period leather shoes with gold leafing that WON’T be too wide for my feet and involve kitchen surgery. 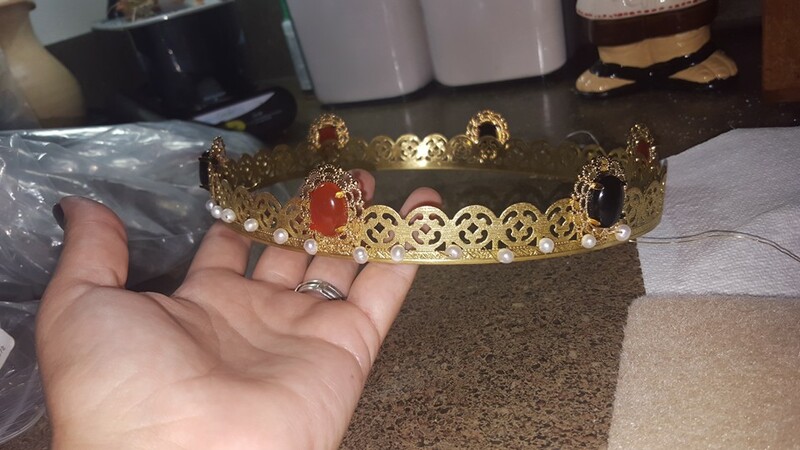 And maybe I’ll learn some metalworking so I can help my husband in making a proper hinged 11th Century coronet, but until then, it doesn’t hurt to use your imagination in the little game we play.